The Bicycle Print is Bummis newest limited edition print. It is a cute, gender-neutral print that depicts Montreal's love for cycling, Bummis' headquarter in Canada. While supplies last. Looking for a wrap that has it all? 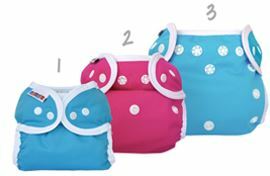 Meet the one-size cover that will take you from infant to potty in style and comfort. The SIMPLY LITE is cute, lightweight and super functional. Bright colours, incredible fit and comfort - and so easy to use!